►DETAILS : For those who have the need for stronger hydrating and nourishing power, or who have a more mature complexion this is the heavy artillery of day creams. 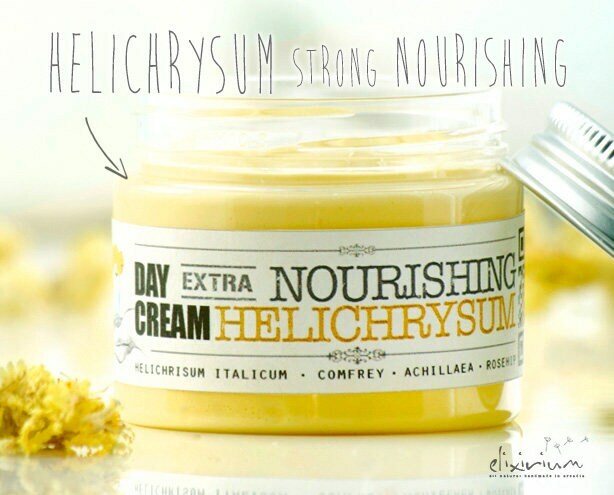 HELICHRYSUM EXTRA NOURISHING ORGANIC DAY CREAM is a powerfull reconstructive cream formula for day time use. It is suitable for all skin types. This cream is as well based on Galien's original ancient cold cream formula so It is leaving a cool soothing feeling on your skin. You can proceed to your usual makeup routine after application. It can also be used as a perfect de-make up cream at the end of the day. 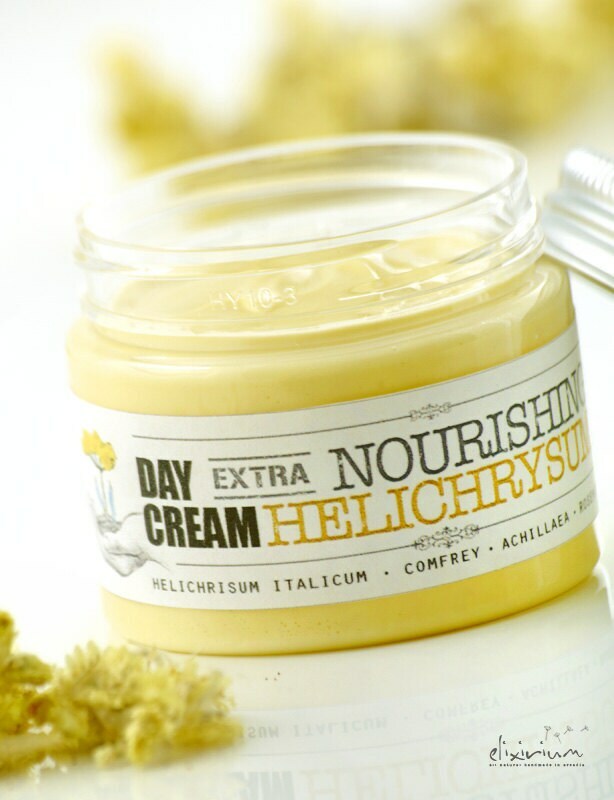 Helichrysum flowers ( Ηelichrysum italicum ) is this cream's precious main ingredient. 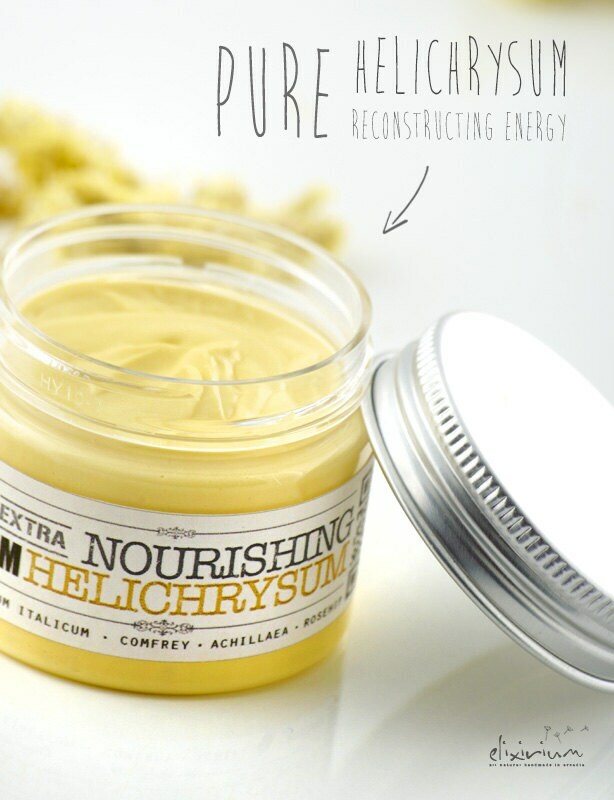 Helichrysum italicum has really outstanding rejuvenating and healing properties. It has the ability to nourish rapidly scars, wrinkles and strech marks. It eliminates bruises of all kind and tightens skin pores. It is working miracles for eye black circles and is famous for it's anti-aging, anti-wrinkle and anti-acne powers as it is also works as a natural antimicrobial. It is equally effective on clearing up spots left on your skin by pox, boils, and other skin irregularities. As a natural skin emollient, it makes the skin smooth, soft and helps it retain moisture. It prevents dehydration and cracking of the skin and rejuvenates skin cells. 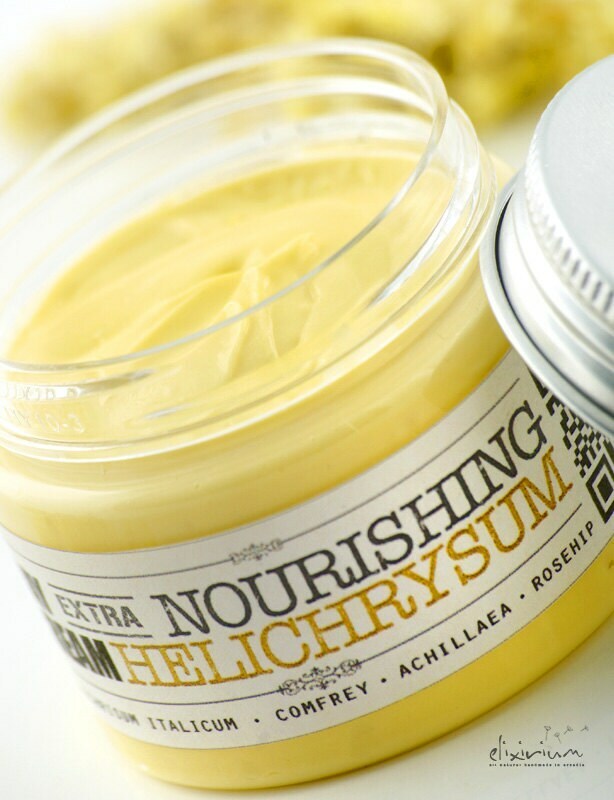 Apart cosmetology properties, helichrysum italicum is well known for a dozen more health beneficial properties as a Antiallergenic, Antiseptic, Mucolytic and many more which you can easily check with just a google search. 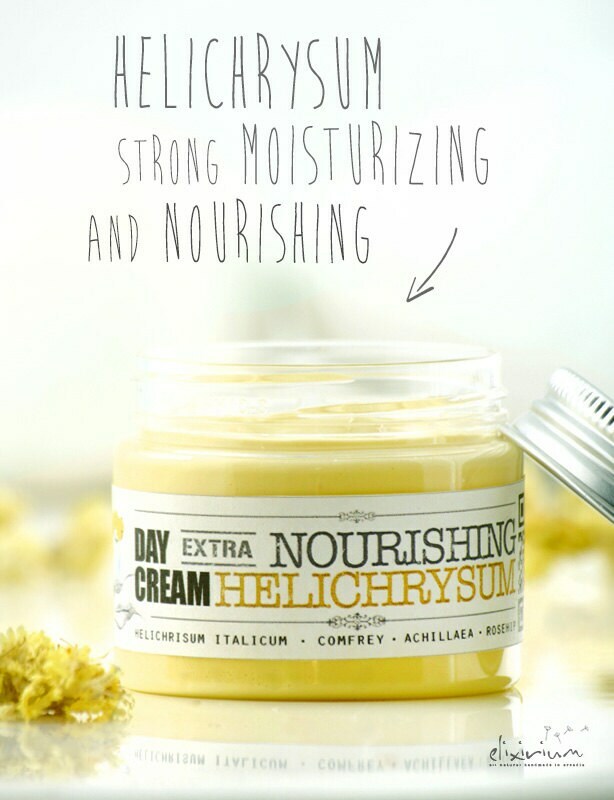 More than helichrysum, HELICHRYSUM EXTRA NOURISHING ORGANIC DAY CREAM formula contains many more essential and organic oils like comfrey oil, rosehip, carrot, achillea oil and more, to add to and complete the beneficial properties of the cream. ► INSTRUCTIONS : Apply a small amount of cream with circular movements on your skin. Apply around eyes to eliminate black circles. Use the enclosed in packaging wooden stick applicator if you like not to contaminate the rest of the cream with your fingers. Rub gently until your skin absorbs the cream. ► SHELF LIFE : Elixirium products are pure and absolutely preservatives-free so for optimal results use it up to 4 months from production date indicated on the bottle. All ELIXIRIUM products are handmade by me after your order so always arrive at your hands all fresh. Feel free to contact me for any questions ! 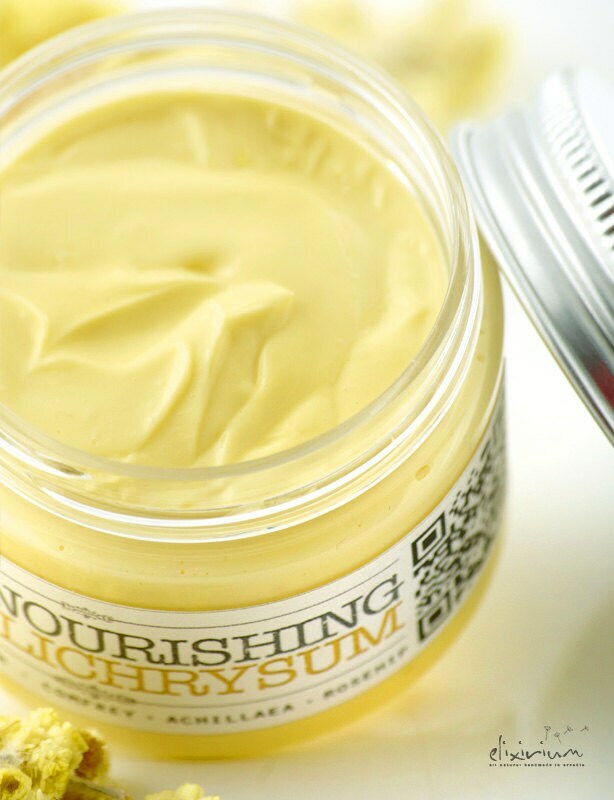 ♼ All elixirium creams come in environmental friendly packaging and premium, recyclable, glass jars. Please recycle after use. Very beautiful facial cream. My skin felt nourished and softer after the first application. I love it! I love the scent of this cream, though the deep yellow color does tint my skin and it's not as moisturizing as I'd hoped. It soaks into the skin well but leaves my skin feeling a bit thirsty. As for the tint, I have a warm skin tone so it's not too problematic for me. But for someone with a very fair &/or cool skin tone, it may be an issue. Definitely a great cream; I use it every morning after the rose toner and it really does hydrate well. I think it lasts a bit longer hydration-wise than the Rose cream, which I tried previously, but it may just be how it works with my skin. Really love this! Everything was great!The quality is outstanding!Thanks Elina!